In a scene from “Under the Blood Red Sun,” an MP separates Tomi Nakaji (Kyler Ki Shim Sakamoto) from Taro “Papa” Nakaji (Chris Tashima). The one-day event commemorates the signing of Executive Order 9066, which set the wheels in motion to forcibly relocate some 120,000 persons of Japanese ancestry into American concentration camps during World War II. It features film screenings, discussions with filmmakers and DVD sales. New this year is a post-event reception with filmmakers from 8 to 10:30 p.m., featuring Shirley Kazuyo Muramoto performing on the koto. Admission to the reception is $20. 10:30 a.m. — “Hidden Legacy: Japanese Traditional Performing Arts in the World War II Internment Camps” by Muramoto. “Hidden Legacy” unveils Japanese traditional arts that continued while Japanese Americans were imprisoned behind barbed wire during World War II. Co-presented by Contemporary Asian Theater Scene. Muramoto will attend the screening, following a rare performance of the biwa by Molly Kyokuto Kimura. 12:30 p.m. — “Nisei Stories of Wartime Japan” (2010, 62 min.) by Mary McDonald and Thomas McDonald Mazawa. Thousands of Japanese Americans were in Japan in 1941 and unable to return to the United States until after the war. The film allows a few of them to relate their experiences in their own words. Filmmakers McDonald and Mazawa will attend the screenings, as well as some of those who were living in Japan during the war. 2:45 p.m. — “The Legacy of Heart Mountain” (2014, 53 min.) Emmy Award-winning documentary by David Ono and Jeff MacIntyre. Heart Mountain, Wyo. is a spectacular and beautiful backdrop to a story of triumph and tragedy. From heartwarming to heartbreaking, the experience of life in an American concentration camp reminds people of the fragility of freedom. Ono will attend the event. 4:30 p.m. — “Under the Blood Red Sun” (2014, 98 min.) by Tim Savage, a feature adaptation of the popular young adult novel by Graham Salisbury. Based on actual events, this is a story of friendship, courage and survival. 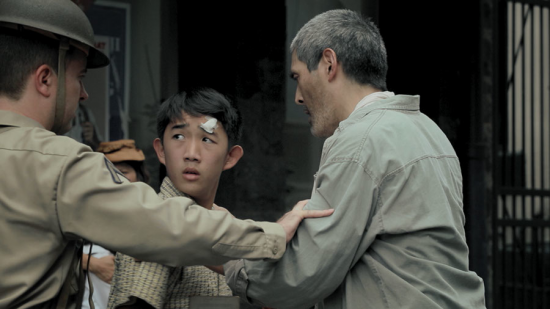 On the island of Oahu in 1941, during the days following Japan’s surprise attack on Pearl Harbor, 13-year-old Tomikazu (Tomi) Nakaji is quickly forced to become the man of the family after his father and grandfather are arrested. Academy Award-winning director/actor Chris Tashima and producer Dana Hankins will discuss the film. 6:45 p.m. — “Hatsumi: One Grandmother’s Journey Through the Japanese Canadian Internment” (2012, 55 min.) by Chris Hope. The film chronicles the journey of discovery for Nancy Okura and her grandson as they travel through the locations of the Japanese Canadian incarceration, and she tells the story of her experience for the first time. Filmmaker Hope will attend the screening. Presented by the Nichi Bei Foundation and funded by the Wayne Maeda Educational Fund, Films of Remembrance is sponsored by the San Francisco Japanese American Citizens League, the Berkeley JACL, the Florin JACL, Union Bank, California Bank & Trust, and Nichi Bei Weekly. Seating is limited. Admission is $8 per film or $30 for all five screenings ($6 per film or $25 for all films for Nichi Bei Foundation members). For more information or to order tickets, visit www.nichibei.org/films-of-remembrance, email [email protected] or call (415) 294-4651. Thank you for posting, Rafu!